...whether it's our grandparents', parents' or our first car - it's usually the car reminding us of our youth, of former times and the car we choose to buy or restore and cherish as 'our classic car'. Without the dedication of their current owners - on maintenance, going to classic car shows, attending club nights, etc, hardly any would still exist. More importantly for me, classic car shows wouldn't occur and thus the opportunity for me to draw so many. 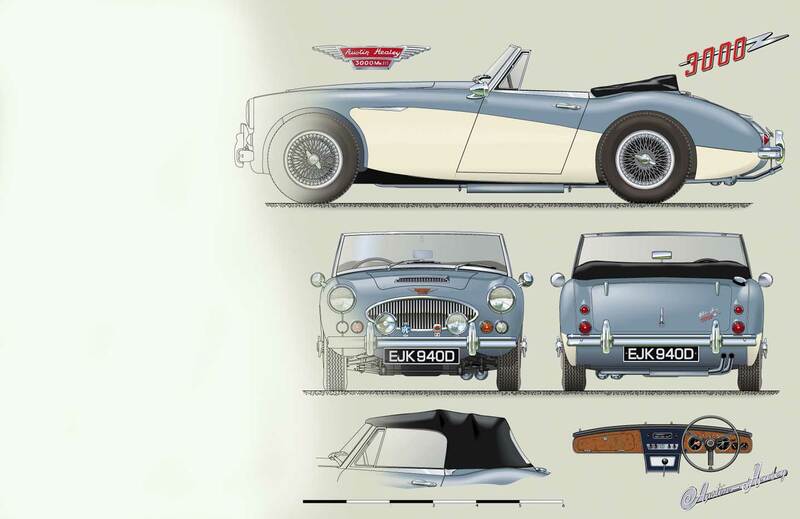 Put simply: if your classic isn't listed here it's likely because I've never seen an example or been offered the invaluable help from an owner to draw one. With appreciation of this enthusiasm, encouragement and subsequent help from these owners, I will endeavour to continue to supply technical portraits at an affordable price for as long as I can. Technical portraits of cars listed here are from £45 (incl P&P). Those with non- standard features may cost more - please send a photograph with your enquiry for these. Please contact me via the email or telephone number above with your enquiry and I will provide a quotation. After accepting this, I will send you a PayPal invoice or confirm payee/address details if you wish to pay by cheque (UK only). Please note: If you are emailing photographs of unusual features of your car that I haven't drawn yet try to take pictures square-on to objects. The camera should be at the same distance from the ground as the object and ideally several feet away on zoom to minimise perspective.